March 15, 2019 – In a ruling with major implications for clergy across the United States, the 7th Circuit Court of Appeals has issued its decision holding that the clergy housing allowance exclusion in federal tax law is constitutional. 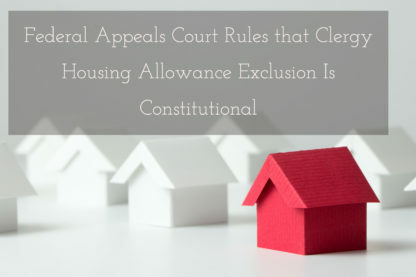 This appeals court decision reverses the lower court’s decision in which the housing allowance exclusion was ruled unconstitutional. It is unknown at this time whether the case will be appealed to the U.S. Supreme Court, and if so, whether the Supreme Court will take it up.